The artistry of more than 70 celebrated cartoonists, from publications such as The New Yorker, Esquire and National Lampoon, debuted today on CartoonCollections.com. That’s thanks to Bob Mankoff, the cartoon-humor editor for Esquire, who also spent 20 years as the cartoon editor for The New Yorker. CartoonCollections.com is the largest digital collection of licensable cartoons in the world. “Cartoons are the artwork of the people. We not only want to preserve the art form, we want to champion cartoonists by supporting them directly and creating new opportunities to ensure cartoons live on,” states Mankoff. The site is a searchable database offering instant licensing and downloads of high-quality images covering an eclectic range of subjects. “If you can’t find what you’re looking for on the website, dedicated Cartoon Concierges will find it for you,” Mankoff promises. And it can draw on a huge inventory. 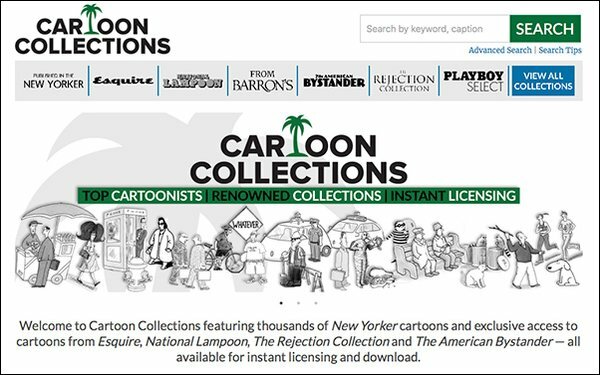 Cartoon Collections acquired CartoonStock earlier this year. Based in the UK, CartoonStock houses a major digital cartoon collection, with 500,000+ humorous and political cartoons, cartoon pictures and illustrations by the world’s top cartoonists. It also offered a veteran team with 20 years of online art licensing knowledge and a successful website with over 15,000 daily visitors. Cartoon Collections’ goal is to offer a megaTOON of 1 million single-panel cartoons, comic strips and other forms of graphic humor. A cartoon caption contest will be held biweekly; the winner earns $100. The first contest is live, with an uncaptioned cartoon by Benjamin Schwartz here. The site is backed by Lawrence Benenson, a principal of Benenson Capital Partners.